Why isn't Conan a Mary Sue? Because one of his legs is both the same like Dumarest and Dr Who and Roland and the screen Wonder Woman, he faces worthy opponents and perils and victory is often bitter sweet. I wrote about this at length for Black Gate (still no Hugo, but we now have a World Fantasy Award, by the way). If you dialled back the opposition and, say, had Conan settle down in Tolkien's Shire to protect the hobbits from the fallout from the Ring War, then he'd suddenly be this all-travelled, super-cosmopolitan, uber killing machine; an embarrassing Mary Sue (using the looser definition of the term*). The same goes for most competent characters who protagonate. It's the plot that makes a Mary Sue, not the character. Continue reading Character and Exposition are Plot: Why most pop critical terms aren't useful to writers. History: is it about kings, dates, and battles, or the movement of masses and the invisible hand of macroeconomics? There's something to be said for both theories, but I have a new, countervailing theory about the 21st century (so far); instead othe traditional man on a white horse who leads the revolutionary masses to victory, we've wandered into a continuum dominated by Bond villains. I think there's a pattern here: don't you? And, more to the point, I draw one very useful inference from it: if I need to write any more near-future fiction, instead of striving for realism in my fictional political leaders I should just borrow the cheesiest Bond villain not already a member of the G20 or Davos. There is no extra credit in science fiction. I learned this from Robin Hobb, though I'm pretty sure she didn't realize that she was teaching it to me at the time: there is no extra credit in science fiction. Now, by extra credit, please note that I don't mean the things that I consider part of baseline professionalism in a writer: turning in a manuscript that is as clean and artistically accomplished as possible, as expediently as possible, and working with your editor to polish and promote the resulting book. What I mean is raising those bars to unsupportable levels, such as: "I will turn in a completely clean manuscript so that the copyeditor has nothing to do!" and "I have a series of simple edits here, which I will resolve be rewriting the entire book, because then my editor will be more impressed with me." Spoiler: The copyeditor will have stuff to do, because part of her job is making sure that if you break house style you're doing it on purpose. Also, your editor will probably be a little nonplussed, and possibly sneak a pull out of the bottle of Scotch in her bottom drawer, because you've just made a lot more work for her. Other manifestations include: "I must write forty guest blog posts today!" and "I must write at least twenty pages every single day to validate my carbon footprint!" And the thing is... it just isn't so. 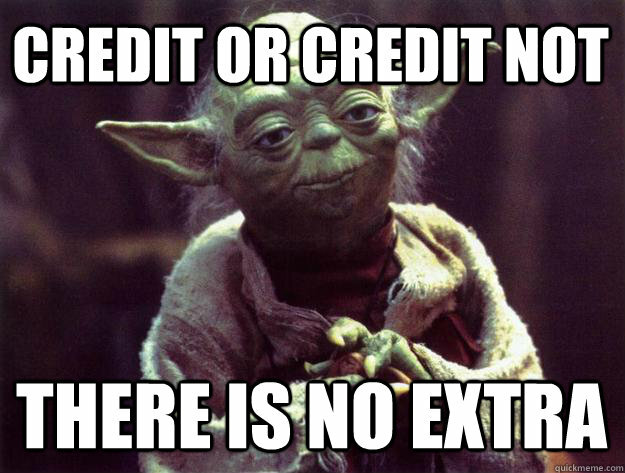 You don't have to do a pile of extra credit work. It doesn't help, and might in fact be detrimental--to your health, your sanity, and eventually your career. It's possible to out-produce your readership's appetite; it's possible to out-produce the publishing slots available to you; it's possible to fuss yourself so much over tiny details that don't actually matter that you add years to your production schedule and die broke in a gutter, or talk yourself out of finishing the book entirely. They're never perfect. They're just as good as you can get them, in the limited time available, and then they're done and you learned something and the next one can be better, you hope. And nobody's going to bump your 4.0 up to a 4.2 because you did a bunch of homework you didn't actually need to do to get the finished product as good as possible, and also out the door. I am taking an (unasked-for) vacation from blogging to attend the bed of a close, elderly, family member who is dying. This is not unexpected, but death doesn't generally happen on a schedule and I've no way of knowing whether it is hours or days away at this point: so life for the rest of us is, perforce, on hold—and so are my blog updates. 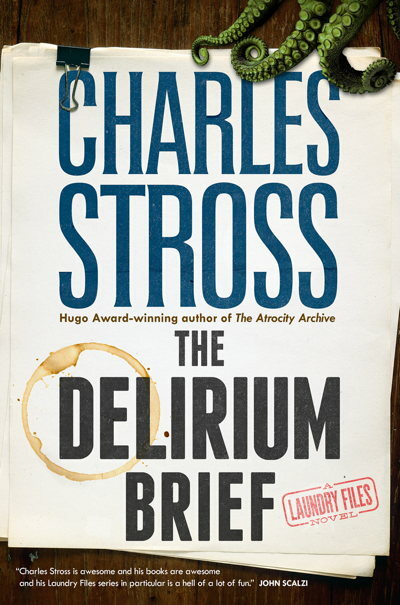 Today (Tuesday) is the official publication date for The Delirium Brief in North America. As of this book, the Laundry Files are moving to Tor from Ace, who published the series from books 3-7. Because it has a different publisher in the UK (Orbit), The Delirium Brief won't officially be out until Thursday—but I gather it's already on sale in many branches of Waterstones. First week sales figures are really important to authors these days, much like first weekend audience figures for a movie. It'll eventually get a price drop (and a low cost paperback edition), but if you want to read it, you'd be doing me a favour if you bought it now rather than later. Also? Reader reviews on Amazon really help—the more, the better. Authors these days are expected to do a bunch of their own marketing, and if the number of reader reviews on Amazon passes a critical threshold (fifty is the number I've heard) then they're more amenable to promotional book-of-the-month deals and future discounts. If you want to order a signed copy, read this. Oh, and there are still tickets to the launch reading/signing at Blackwell's Bookshop in Edinburgh on the evening of Wednesday 12th. Your flight has been mysteriously transported 20 years into the future. How could this happen? Wait, that's not important. Take a deep breath. Look around. Without a doubt, the world has changed. What new technologies and innovations have reshaped the way we live? XPRIZE, ANA and the world's top science fiction storytellers are embarking on a journey to 2037, envisioning a world transformed by exponential technologies and a global community of innovators. We'd like for you to join us. Seat 14C is, at its core, an earnest endeavor into our possible future. We invite storytellers from around the world to submit their visions of 2037, as told from a passenger aboard ANA Flight #008. Disclaimer: when I was invited to contribute to the anthology I had to say "no" because I was up to my eyeballs in work-related rabid ferrets (read: deadlines). I'm still waaaay too busy to emit a short story, largely because I have recently discovered to my horror that my ability to write works of fiction less than 20,000 words long has atrophied due to lack of use. However, if I was going to write an entry to this competition, it might read something like this. Continue reading Report on Seat 14C.